I could write a blog just about clouds. They’re one of my favorite meteorological subjects. Like Charlie Brown and friends, as a kid, I’d lie on the ground and watch the clouds passing overhead in the sky. Wondrous forms would appear: animals, mountains, faces I recognized, and sometimes things that could best be described as natural art. 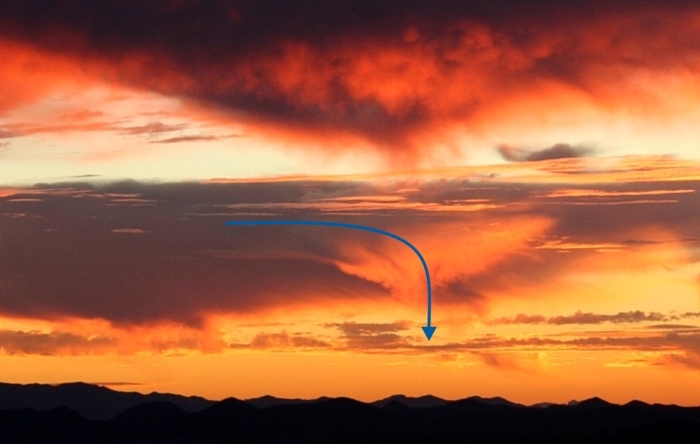 The image above shows a “waterfall in the sky” photographed just after sunset in November 2013. I didn’t have time to set up for video, as the event only lasted for 10-15 minutes. Lighting from the setting Sun was critical. But the mass of bright orange cloud in the center of the frame was literally flowing (slowly) downward like a waterfall. Technically, this was an unremarkable example of a layer of humid air cooling, becoming more dense, and “sinking” through the less-dense layers below. At this time of day (and season), air closer to the ground is usually warmer than the air above. As this warm air rises, cooler air from above sinks to replace it. It’s just the typical atmospheric mixing that occurs around sunrise and sunset when temperatures change rapidly. Then it dawned on me what I was seeing was literally a “waterfall in the sky.” Clouds are, after all, droplets of liquid water. See my 24 June 2013 Sky Lights for more on that. And this water was visibly falling under the influence of gravity. The only difference between what I saw and, say, Niagara Falls, is that in this case the water drops had a lot more empty space between them. Still, it was falling water. The average flow rate of Niagara Falls is about 5 million kg/s. If you ask how this “waterfall in the sky” would compare to Niagara, a quick back-of-the-envelope calculation shows that this waterfall is approximately 0.1 Ni (Niagaras). Of course, water from Niagara falls much faster. But this fall is 2-3 km wide. Had the humidity and temperature been slightly different, this “waterfall” could have become rainfall, or perhaps virga, but such was not to be. Still, it was beautiful effect to observe, and I’m glad I got this photo to share with you. Next Week in Sky Lights ⇒ Santa’s Sleigh Spotted? Next Next post: Q&A: Santa’s Sleigh Spotted?